Print Server can connect multiple computers to a single or multiple printers wired or wirelessly. With the help of the Print server, you can access your printer with multiple devices and can send the print command from any of the connected devices to the printer to print any document. 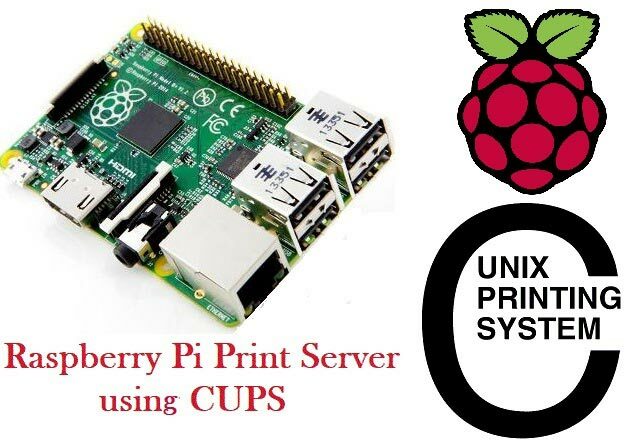 For this Raspberry Pi Print Server tutorial, we will be creating a Network Printer with the aid of the Raspberry Pi 3 and the almighty CUPS which makes it all possible. CUPS (Common Unix Printing System) is a printing system for UNIX like operating systems based computers. It gives computers on which it is running the ability to act as a print server. A computer running CUPS is able to accept jobs from client devices, process them and pass it on to the appropriate printer to print. All most all printers are supported by CUPS especially HP printers since HP operates its own open source project. Other printer models that are not directly supported by CUPS may have generic drivers that are compatible which provides basic printing functions. A list of printers supported by CUPS can be found at this attached links. For this tutorial, we will need the following components, some of which you may certainly have laying around and won’t need to buy. To proceed, we will be using the Raspbian stretch OS for this tutorial and since its setup is same as that of the Jessie, I will assume you are familiar with setting up the Raspberry Pi with the Raspbian stretch OS. I also want to assume you know how to ssh into the Raspberry Pi using a terminal software like putty. If you have issues with any of the things mentioned, there are tons of Raspberry Pi Tutorials on this website that can help, and you can also drop your questions in the comment box and I will do my best to respond. With your Pi at the ready, Let's make a Raspberry Pi Print Server! This section will carry us through a series of steps that will culminate in the installation of CUPS on your Raspberry Pi. Kind of a ritual, first thing for all of my projects is updating the Raspberry Pi, by doing this you ensure your pi has all the latest updates to the OS you are working with. With the update done the next line of action is to install our print server software CUPS. This will take some time but will install CUPS and other dependencies like Samba, perl and several other software or libraries. With Installation done, its time to check out the configuration file of CUPS. Several settings that generally affect how cups works, like the port on which cups communicate which is by default 631, port can be changed here. Change/add the following lines to the configuration file. Save the file using ctrl+X followed by y and then enter. Next we add the Pi user to the Ipadmin group. This gives the Raspberry Pi the ability to perform administrative functions of CUPS without necessarily being a super user. Next we need to ensure that CUPS can be connected to on the home network and its also accessible across the entire network. With this done we can proceed to test if it works effectively by checking out the CUPS homepage. Open a web browser and type in your Pi’s IP address, indicating the cups port. 631 is the cups port. You should see the cups homepage like the image below. With this done we are ready to move to the next step. Samba is an interoperability tool that allows for easy communication between windows and linux or unix programs and it will be used to allow our windows based system to communicate with CUPS running on the Raspberry Pi to print. While cups is being installed, it installs other dependencies like samba, but just in case it wasn’t installed, you can install it by following the procedure below. Wait for the installation to run its course then proceed to configure samba. With this all done save the file using ctrl+X followed by y and enter. With samba installed, our Raspberry Pi is finally ready to be attached to a printer so we take the final step which is adding a printer to cups. Now on the home page, click on the administration tab. This will take you to the administration page where you will see add new printer. Follow the prompts, select your printer server and continue. On the final stage before clicking on continue, ensure you checked the “share this printer” check box. With this you are all done, move the printer to the preferred location, fire up your Raspberry Pi and print away. With this done, you should now be able to print via a Raspberry Pi network printer. That’s it for this tutorial guys, feel free to drop whatever questions you might have in the comment section.